Michael Fleisher remarked in HEX #2’s letter column that, in the world of 2050, “there are no hordes of costumed men and women...to haul your keester out of the fire.” His statement was rendered false when he introduced a brand-new incarnation of Batman in HEX #11 (July 1986). A former criminology student in New York, he'd discovered the remains of the Batcave in Gotham the same day the bombs dropped, and with the Combine (a version of the Conglomerate) trying to take over the East Coast, he took up the mantle of the long-dead Batman and vowed to keep the New York safe, which includes keeping firearms out of the city. The Combine isn't too happy with this, and sends a couple of goons all the way out to Seattle in order to get someone both skilled and unknown to kill him. Wouldn’t ya know it, Hex fits the bill! These guys are presumably the ones who kidnapped Stiletta three issues ago, because they tell Hex that Batman tortured and killed her, and even show him Stiletta’s bloody clothes. They fly him to New York so he can get “revenge” on Batman, and thanks to Jonah wearing his guns right out in the open, Batman finds him first. We get a great five-page tussle that ends with the two of them falling off a rooftop, but luckily HEX #12 opens on them working together to avoid becoming street pizza. It’s not long afterward that Jonah discovers he’s been bamboozled, and Batman is not only kind enough to give him a lead on where the Combine might be holding Stiletta, he also lets Jonah keep his Rugers, so long as he gets the Hell outta New York once Hex finds his gal. Harris and his new friends are rounding up gang members to be used as slave labor at the behest of some pointy-eared fella. It’ll be a couple more issues before we get any real information on him, so for the moment, we’re gonna ignore the fact that Hex is being crowded out of his own book by a bunch of long-underwear types and concentrate on Jonah, who finally locates Stiletta at another "cat club" in HEX #14. Unfortunately, she's been pumped full of mind-controlling drugs, meaning she damn-near kills Jonah before he works up the nerve to knock her senseless and get her out of there. Not long after Stiletta recovers, Jonah overhears a guy talking about how he escaped from the work camp that the Dogs of War are dragging folks off to, and that he thinks the strange man in charge is actually a time-traveler! We get another good shock with HEX #15, as Mark Texeira is no longer on art duties, and the legendary Keith Giffen has taken his place -- it’s a jarring change to say the least, but we’ll just have to roll with it. The issue opens with Hex telling Stiletta about what he’d overheard, and that he wants to investigate in case it’s true. There’s a bit of a geographical anomaly here, as the work camp was supposed to be three thousand miles away from New York, so we can only presume Jonah had to cover a lot of ground tracking down Stiletta, and they're near Seattle once more. Later on, we have to wade through four pages of exposition from S’ven Tarah, our pointy-eared, time-traveling friend. The short version is that he’s from a very distant future where Earth has been conquered by an alien race called the Xxggs, who travel across space in generational ships and enslave any planet that crosses their path. S’ven Tarah used a time machine to try and escape to a past era where he could find help, but Borsten ensnared him somehow. Trapped in 2050, he struck a deal with Borsten, assisting the despot while he secretly worked on a way to stop the Xxggs from this timeframe. After Borsten’s empire fell, S’ven Tarah was free to carry out his plans, which include endowing the Dogs of War with superpowers, because why not? “Love you?! ?” she replies in disbelief, thereby putting the kibosh on any notion that she’s ever harbored romantic feelings towards him. Such things don’t matter when you’re trying to save the world, however, and the plan moves forward, with Hex and Stiletta tricking the Xxggs into following them down a tunnel adjacent to where the spaceship’s exhaust ports are located. The duo slips away just as the engines fire up, obliterating the Xxggs. With the spaceship containing Harris and the Dogs of War safely underway and all the prisoners released, the only ones left in the facility are Jonah, Stiletta, and S’ven Tarah, who tells them that he is about to depart back to his own era -- he knows the Xxggs will never stop hunting for him, so he’s going to erase his memories about what he’s done in 2050 to keep the Xxggs from learning about his plan once he arrives home. “By the time they interrogate me, I will have nothing to confess to them,” he says. He then thanks Jonah for his assistance, but the bounty hunter doesn’t care about being thanked, he wants to go home to 1875, and practically begs S’ven Tarah to send him back. Unfortunately, the time-travel device only has enough energy left for one trip, and S'ven Tarah uses it for himself before Jonah can convince him otherwise. It’s after this final scene that the reader discovers HEX will be coming to an end next issue. Despite good numbers at the outset, the title just couldn’t find a large enough audience to save it from cancellation. Looking back, the biggest problem with HEX was that Michael Fleisher’s reach exceeded his grasp: in an interview with Dwayne Hendrickson in 2009, Fleisher admitted he wasn’t well-versed in science-fiction, and when Mike Browning spoke with him for Back Issue #42 (August 2010), Fleisher said that, despite the work he’d done previously on the Spectre and Ghost Rider, he “always felt awkward with superheroes”. Considering the majority of HEX revolved around either sci-fi concepts or superpowered beings, it’s almost as if he was setting himself up to fail by these conjuring up these world-threatening situations where Jonah got lost in the shuffle. 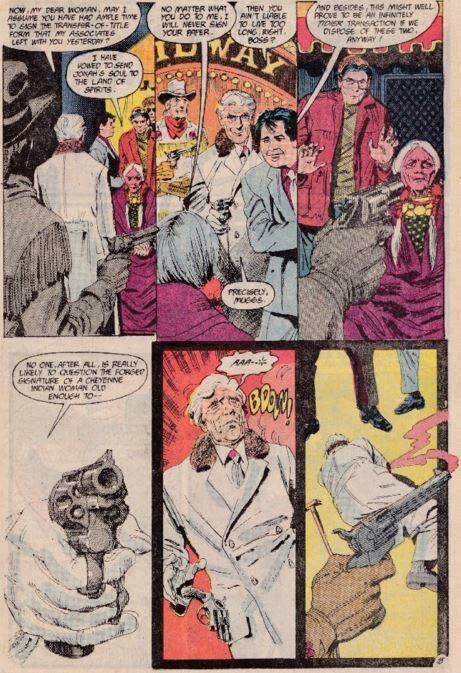 The best stories were smaller in scale, like what we see in HEX #18 (February 1987), which revolves around Jonah dealing out bloody vengeance one skunk at a time. What must it been like for Jonah, to have come so close to dying earlier that day, then finding this thing covered in dust inside a ramshackle warehouse later on? The only comment we get from him on the subject is “Ah guess it means Ah’ll be goin’ back home one day...after all.” At the moment, I suppose that’s all the comment he can muster, and since the issue ends right there, we’re deprived of any follow-up, as well as any clue as to how Jonah actually gets home. Just as Bob Greenberger said, the previous existence of that stuffed and mounted corpse in DC history guaranteed that, should HEX fail as a series, the man would indeed be returned to the Old West at some point, but to divulge the information to Jonah like this is both a blessing and a curse. He has to look upon Death itself, the companion that follows him wherever he goes, now sheathed in his own skin and brandishing his Dragoons (last seen in Jonah Hex #83, right before he chucked them into a lake... did he somehow recover them once he returned to the past? ), but offering Jonah no information beyond its own presence. All he knows is that he will die in the past, not the future, and that he will be an old man when it happens. While this scene helps to confirm that HEX remained in-continuity after its cancellation, it also neatly avoids answering the question of how Jonah got back to the Old West: Jonah didn't tell Tall Bird, so she can't tell Lawrence. 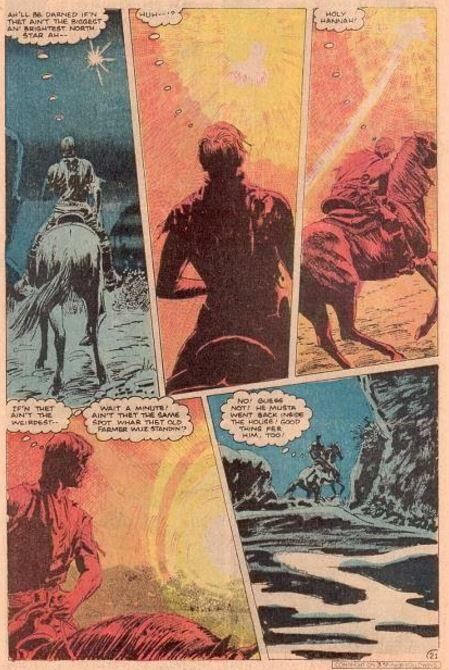 He also asks what drove Jonah "to become the most renowned manhunter of his age." So Tall Bird tells him that when Jonah was a boy, his father presented him with a rifle on his birthday. Later that night, Woodson went off on a drunken tear and began beating Ginny for supposedly "slippin' around" instead of attending to her wifely duties. 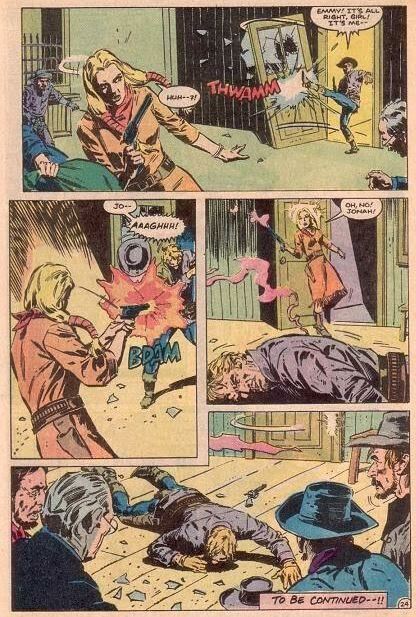 Jonah grabbed his new rifle, presumably with the intent to shoot his Pa, but the man knocked his son to the floor before he could do it (if you recall, young Jonah also got a hold of a gun way back in Jonah Hex #27, but kept it well-hidden...this incident here might be why). Just as with Lew Farnham's assistant eighty-three years before, the stuffed and mounted corpse of Jonah Hex fatally shoots Mr. Lewellyn, but unlike last time, it's a little hard to write this off as accidental. Tall Bird described Hex earlier as a "restless spirit", and this seems to confirm it. To be sure, Lawrence is convinced: "By tomorrow morning, we'll have you out of here forever, Jonah! I-I promise you that!" he says over his shoulder as he and Tall Bird are escorted out of the park by police...but did he truly keep his promise? 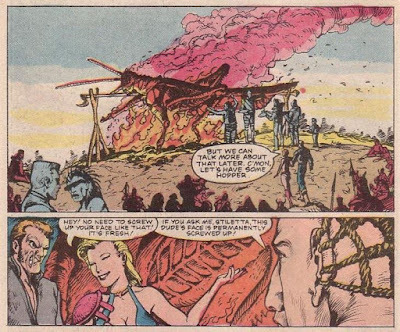 The final panel is reminiscent of the one for "The Last Bounty Hunter", with Jonah being left on his lonesome in the middle of an amusement park. The reader is left to presume that Jonah's body will soon be put to rest, but how could Jonah stumble across his own corpse in 2050 if it was cremated in 1987? 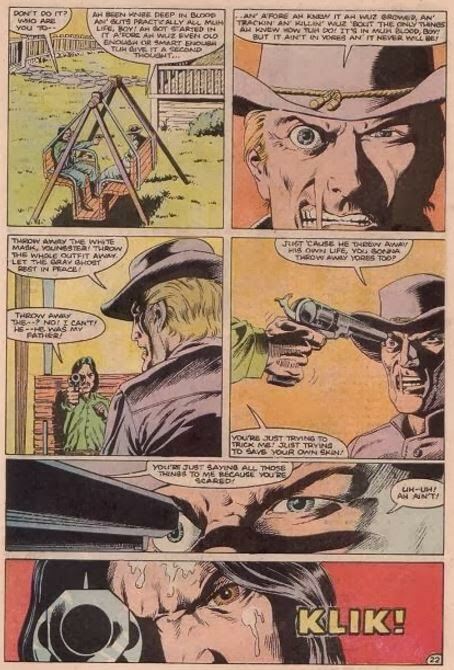 Evidence will later surface that the corpse remained intact for many years to come, but that will come from other writers, as this was the very last Jonah Hex story penned by Michael Fleisher, making his final tally a whopping 126, one of the longest runs for a writer on a non-creator- owned comic. In the years since Fleisher and Hex parted ways, both have stayed busy. Fleisher went back to college and earned a doctorate in anthropology from the University of Michigan -- though he continues to write novels and other papers, his last official comics credit was in 1995, for the UK anthology 2000 AD. 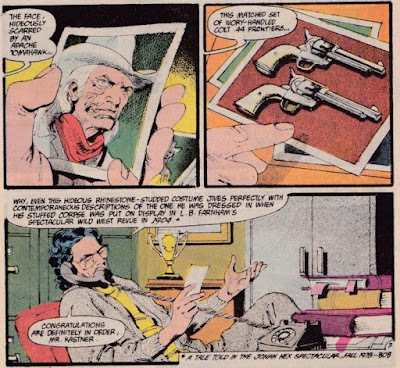 It seems that, without Jonah Hex around, he lost interest in comic books, and in recent interviews, his memories of those days has grown fuzzy, meaning some unanswered questions from his run will remain so. 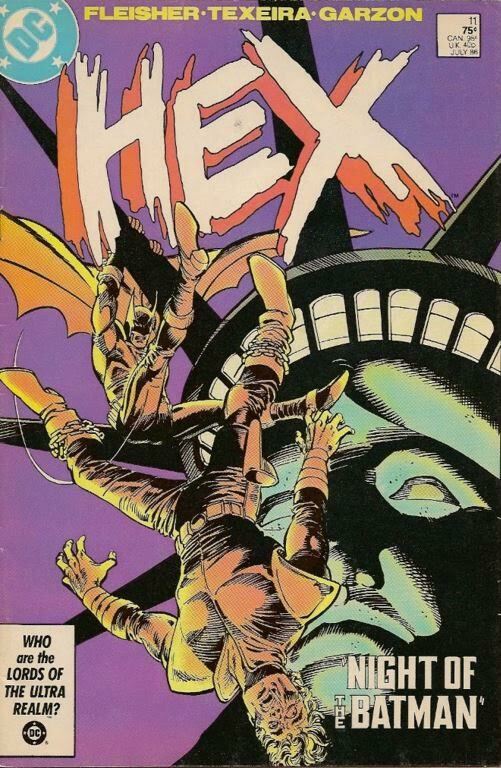 As for Hex, he got a trio of Vertigo miniseries courtesy of Joe R. Lansdale in the 1990s that put the "weird" back into Westerns. 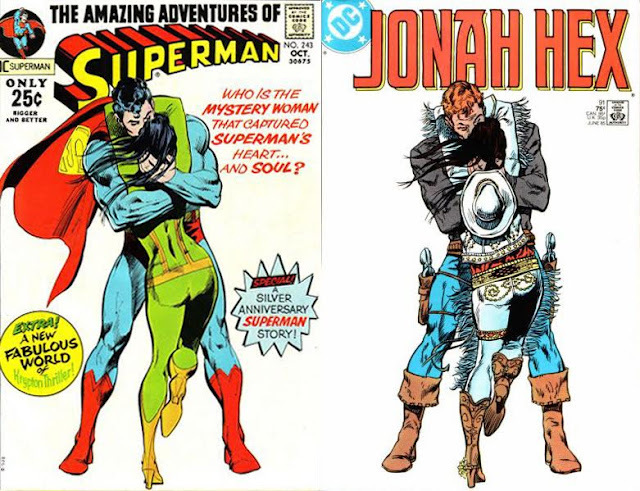 Then in 2006, Jimmy Palmiotti & Justin Gray started a new Jonah Hex monthly series, followed by Jonah's return to All-Star Western in 2011 -- both titles reflected some of the best aspects of Fleisher's run, and even retold a few classic tales with an added twist or two. They also rivaled Fleisher for longevity: as they closed in on All-Star Western #28, their 100th Jonah Hex tale, I told Jimmy Palmiotti that, if he and Justin Gray stuck it out until issue #55, they'd beat Fleisher's record. Palmiotti replied, "He should keep that record. It is his." 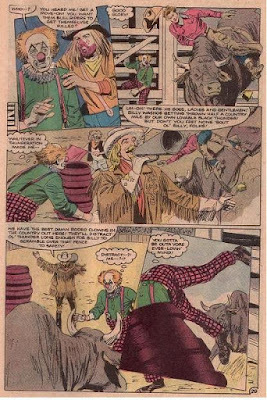 Six months later, All-Star Western came to an end with issue #34... just twenty issues shy of tying with Michael Fleisher. 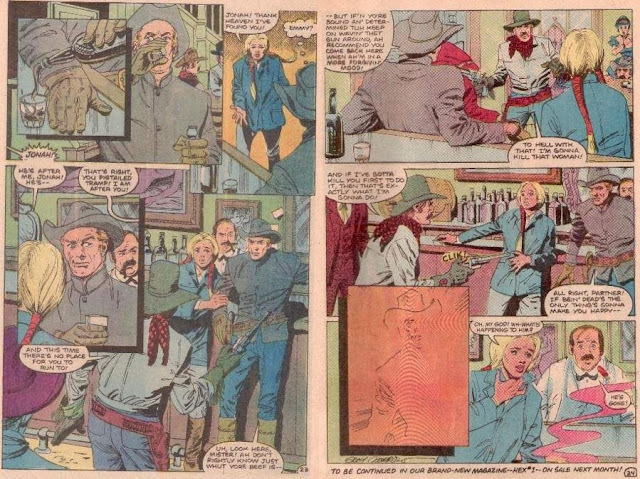 This series of articles was adapted from "An Illustrated History of Jonah Hex", an ongoing project chronicling the character's life both on the comics page and behind the scenes. Look for a new installment on the One Fangirl's Opinion blog page this May 1st. All content in this article entry written by Susan Hillwig. If you want to attribute any of this work, please credit Susan Hillwig. 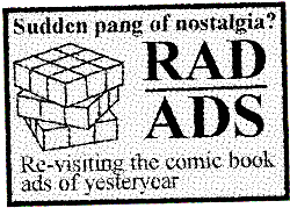 Welcome back to another edition of DC in the 80s' Rad Ads. Thank you for all the kind words on our inaugural piece! We look forward to continuing this column for a long time to come. 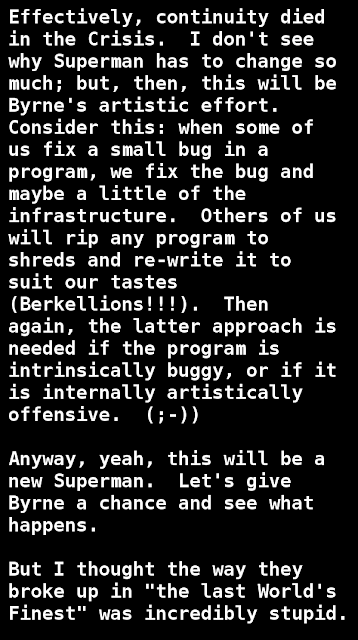 We're still playing around with the format, and welcome all feedback. Until then, let's ignore that note that tells us our story "Continues on 3rd Page Following" and dive back in to the ads! 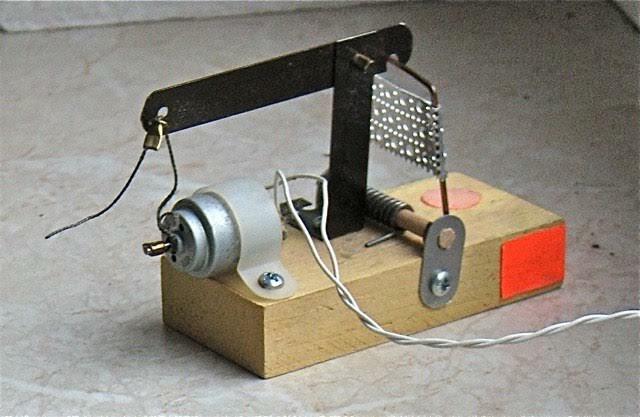 Okay, now you're not an 80's kid if you don't remember these. Imagine annoying your family and neighbors with incessant knocking and prodding... trying to sell that one extra greeting card so that you could "cash in" on that Voltron Calculator Robot (Sell 16 Items!) you'd been eyeing. While we're imagining... picture sending your 10 year old kid out to knock on random strangers' doors... yikes! In the fine tradition of GRIT... Captain "O", who I suppose these days we should call "Captain Winter (or Summer) Games" lest the commission drop a two-ton lawsuit on our heads, was a mainstay in comics all throughout my childhood. I used to always make note of the perky little operator in the bottom right hand corner, as she always had a different name... one month she's Sally, the next Bridget... Maybe she was in witness relocation... or maybe she was a Stepford Operator. I never mustered the gumption to call Ms. Sally, but I will admit that I poured over these pages month in and month out, imagining plugging in my Portable TV (Sell 60 Items!)... or heaven forbid, riding down the block on that brand new BMX bike (Sell 80 Items!). The (sales) power is truly in your hands with Captain "O". As a plucky entrepreneur, you can choose points or cold-hard cash for your hard work. 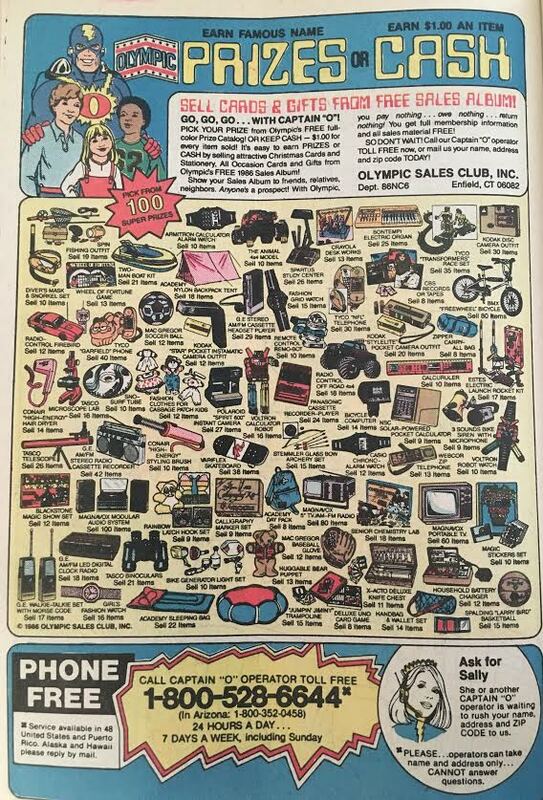 $1.00 (in 1986 dollars, no less) per item sold. Which really makes me wonder, just how much was the good Captain charging the unwitting public for a greeting card? The Olympic Sales Club, Inc. later became Olympia Sales and is still in existence today. They currently have three lines of greeting cards including Fravessi Greetings (which is listed as their "affordable" brand), paperstreet (which is a more upscale variety) and Enfield Stationers which offers a more personalized greeting card to businesses and what-not. A quick check at their Fravessi line shows they offer greeting cards for "$1 or less", now tell me, how would a contemporary Captain O minion gonna make any scratch that way? By the way, if you were thinking the "O" stood for Olympic... or even Olympia, you'd be so wrong. The "O" is for O'Hara, the family who has owned and operated the company since it's inception back in 1966. So, Happy 50th Captain O! There is an Olympic Sales Club Facebook page, which appears to be somewhat dormant following an "Exciting News to Come" status update in August of 2014. Some interesting discussion is found there, wherein some veterans of the sales war discuss prizes they received (or didn't receive as the case may be). Man, how didn't I know about this book at the time? Whodathunk, all it would take to improve my (very) early love life would be a $3.00 Golden Spread Survey from Amarillo, Texas? Golden Spread... don't know about you, but that sounds absolutely filthy... Just what in the world is a Golden Spread? Well, Golden Spread is a term that was coined by Amarillo radio personality Bob Izzard in 1954 in attempt to increase tourism to their fine town. The word 'Golden' suggested sunshine, and 'Spread' was in reference to the many ranches in the area. Many local businesses out Amarillo way have these words in their name even to this day. There is precious little online in regards to this ad, in fact a Google search of "Girls Thoughts Revealed" (with quotes) only yields FOUR results. So, if there are any cats or kittens out there who were lookin' for love (in a comic book ad page) in 1989, help a brotha' out. Now here's our "Wildcard" ad. 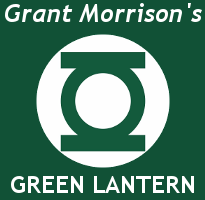 Not quite in the 80's (this is from a 1993 issue of Green Lantern: Mosaic) but still eye catching... for all the wrong reasons. First off, look at that adorable li'l fly. Laying there all coy... just loving life. She (?) ain't hurting nobody... but the folks at Durham want her (?) DEAD regardless. 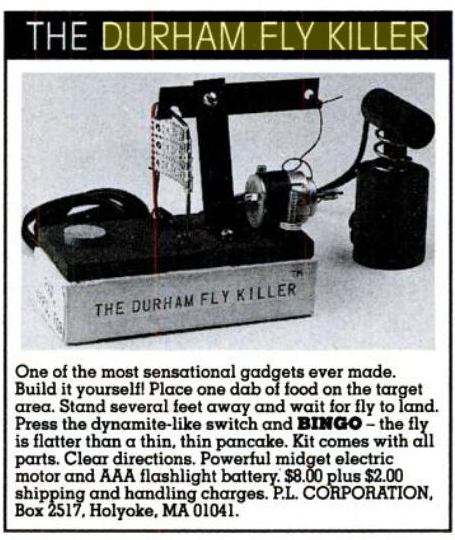 The first time I saw this ad, I actually thought they named the li'l bugger BINGO. As in "Bingo the fly" is dead. Here's a better look of the death chamber.from an old issue of Popular Mechanics. Imagine, this is the last thing many a fly ever saw before shuffling (or squishing) off this mortal coil... and flies, to my knowledge can't read... so how are they to know this machine means to kill them... rendering them thinner than a thin, thin pancake. Yikes! 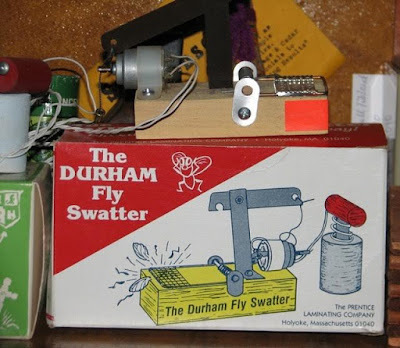 You too can live our all your executioner-fantasies by luring a harmless fly to what it believes to be a yummy meal... only to see out of the corner of their compound eye, some sick twisted individual excitedly push down a plunger "dynamite" style. A few more views of the scarily primitive, almost cub scout quality killing apparatus. That's all we've got room for this time. As always, I hope you enjoyed. If you have anything to add (or any ads you wanna see covered) please let me know. If you have any ads YOU'D like to comment on, drop me a line in care of this website and we'll work something out. Thanks for reading! 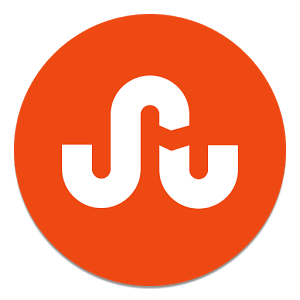 if you liked what you read, look for this icon below the article and click on it. He began life as a villain. Finding this role didn't suit him, he teamed up with a popular hero, much to that hero's chagrin. After a while of playing the comic to said hero's 'straight man', he got his own series. A series in which he exhibited a unique fourth-wall-breaking brand of humor - chatting with the audience about how difficult it was being a comic book character. Who am I speaking of? Why Ambush Bug, of course. Did you think I mean Marvel's Deadpool? If so, it is easy to see how you might come to that misconceived notion. The similarities between the two characters are staggering. 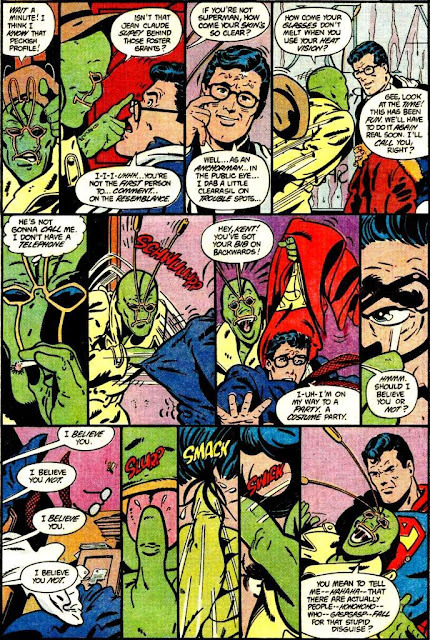 Ambush Bug sprang from the demented brow of Keith Giffen as a comedic foil in the now classic DC Comics Presents #52. The year of that appearance was 1982 and at the time, DC Comics Presents ran as a 'Superman team-up' book. Issue number 52 featured none other than the Doom Patrol, a squad known for attracting odd rogues. Yet Ambush Bug, the unorthodox villain of this piece, attached himself to the Man of Steel instead. Ambush Bug was the alter-ego of Irwin Schwab, who may or may not have been a mental patient. His power came from his suit which had both narrowly escaped the destruction of its home planet via rocket ship and been bitten by a giant radioactive space spider. It endowed Schwab with the power to teleport. Taking on the name Ambush Bug, he proved to be a raving nutjob from the very beginning. His first few appearances mirrors Deadpool's scuffles with X- Force - in that they don't exactly capture the tone of the character. This nascent form of both gentlemen-antiheroes doesn't bear the trademark humor and fourth-wall breaking commentary for which they would become known. Eventually both of them evolved into a kindlier, more relatable lunatic (if such a thing is even possible). A minor adjustment happened in Supergirl v2 #16 (1984) in which Ambush Bug decided to become a hero, an issue penned by Paul Kupperberg. A similar shift struck Deadpool much later in his own career path. Yet neither of them became true heroes, both emerging more as wacky and irreverent commentaries on the medium they inhabited. For Ambush Bug, his complete metamorphosis occurred in his fourth appearance, Action Comics #560 (1984). 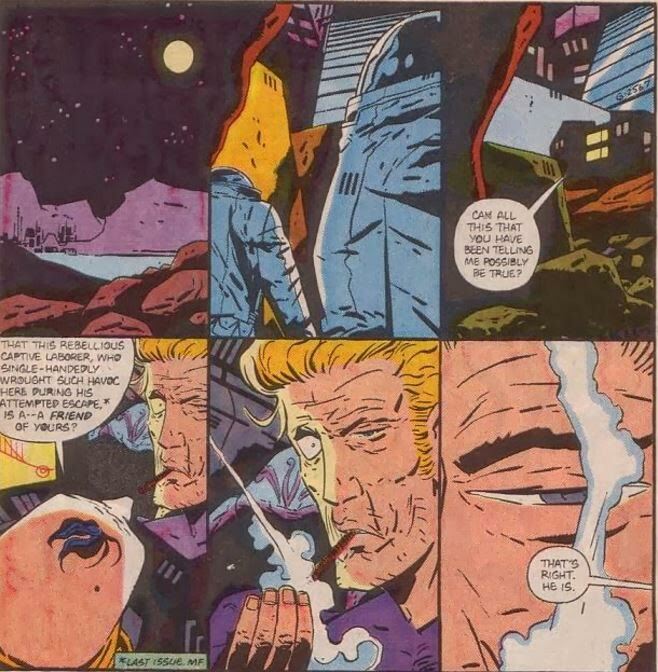 Back in the capable hands of Keith Giffen as writer/artist and joined with Robert Loren Fleming providing dialogue, suddenly Ambush Bug hit a groove. In the issue he figured out Superman's secret identity in a comedic series of panels that had him undress Clark Kent, right down to administering the classic spit curl. From there on out the issue got more demented, showcasing his inclination of talking to the audience and Giffen's own penchant for nibbling at the hand that feeds him. The very next year was huge for the Bug. He starred in two Superman titles and went on to host his own four issue mini-series. Through those four books, Giffen and Fleming stabbed their biting wits at everything from DC's editorial process, to what became of the lost characters wiped away by DC's Crisis on Infinite Earths, to the very comic book readers themselves. And it is precisely this brand of commentary that echoes in Deadpool's unlimited series. The characters know the medium they inhabit and frequently reference that fact. If anything, Ambush Bug went further than Deadpool even dared, dragging the creators in as butts of the joke and openly mocking the editor-in-chief of DC comics. True, Ambush Bug never came off as a bloodthirsty killer with an amoral center and no respect for human life. Deadpool certainly did. 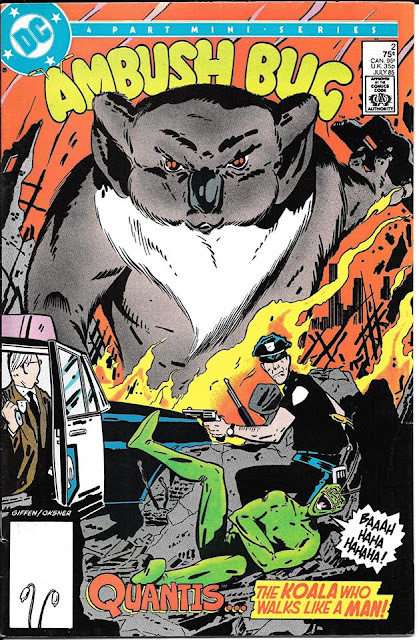 However, something along those lines happens at the end of issue 2 of his first limited series when he cures the giant-sized Quantis, The Koala That Walks Like A Man, and then subsequently crushes the mad scientist he turns back into with a giant-sized glass syringe. For laughs. And we the audience accept this on-camera slaughter because the heroes know they are just ink on a page. When Deadpool says he hasn't seen a villain since "issue sixteen" and then goes on to straight up murder an entire alleyway of clowns, we can laugh with him at the absurdity instead of being horrified. The indifference is earned. 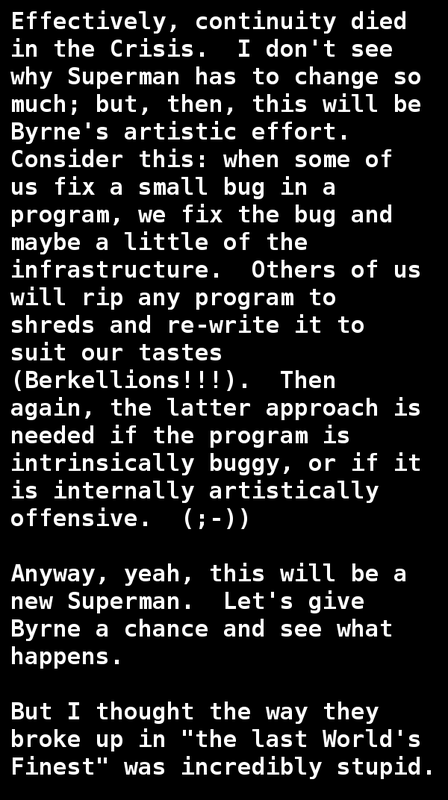 Ambush Bug showed how to desensitize the audience. His entire second series featured a running joke on Ambush Bug dying and being sent to Hell multiple times. The punchline being that there was a door to exit anytime he wanted to leave. In a way, Cheeks the Toy Wonder even predicted the Death in the Family storyline and coined the phrase "Dead heroes sell". Sadly, Ambush Bug never achieved the popularity of his spiritual heir. I believe he owes much of that to the fact that Giffen and Fleming's humor wasn't as widely understood as Deadpool's. The jokes about bit characters The Green Team and the flagging success of Fleming's Thriller title were obscure jabs even then. In context, and with an informed comic book fan audience, they backed up a Brinks truck of comedy gold. However, accessibility by the mainstream, non-comic buying audience was elusive. And while the character remained popular, his potshots across the bow during the second series, Son of Ambush Bug, may have led to editorial shutting down future books. Or Giffen's success with his incarnation of the Justice League took too much of a toll on him to continue. Either way, we the audience were left poorer for it. What we do have is a hand full of appearances in other books and three limited series, the latest in 2008, as treasures to preserve. And while The New 52 is currently deemed a bust, the idea of using Ambush Bug as part of the two-page Channel 52 news spot previewing upcoming titles in the back of each book was sheer genius. If only the execution had matched it. For now we will have to sit on our hands and wait. DC's Rebirth is supposed to put some things back as they were. We can only hope that Ambush Bug, with Giffen and Fleming at the helm, will pop in to spice things up. Maybe even crossover with Deadpool. Or star in his own movie. I hear they are all the rage these days. All content in this article entry written by Michael Alan Carlyle. If you want to attribute any of this work, please credit Michael Alan Carlyle. Michael also writes the very fun Crapbox of Son Of Cthulhu blog which we recommend you check out. 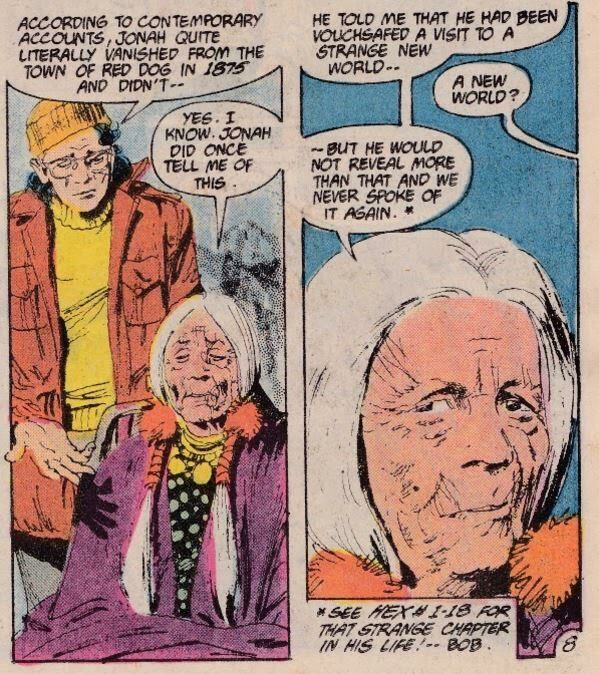 As befits a series built around time travel, we’re going to start off this installment by skipping ahead one month into the future so we can look at the letter column for the second issue of HEX, wherein Michael Fleisher tells us how he got the inspiration to move Jonah into a new environment. 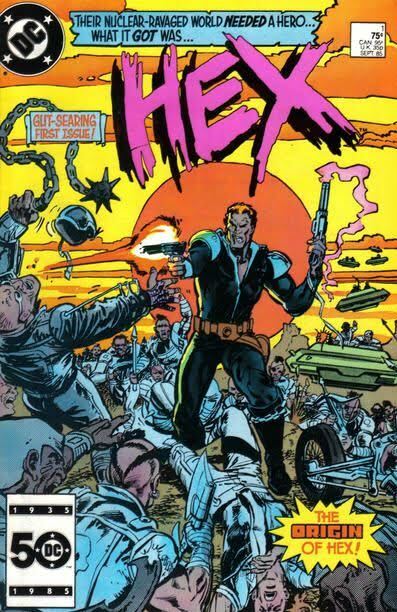 Unlike the tale related by Bob Greenberger -- who thinks Andy Helfer may have been the influence behind dropping Hex into a Mad Max-style setting -- Fleisher credits someone else with providing the initial inspiration. Designer Ed Hannigan came into the DC offices one day with a HEX logo hand-painted in violet and hot pink. While he was responsible for creating many great designs for DC over the years, Fleisher wrote that Hannigan "had not been asked to design any such logo and had no expectation whatever of being paid for it. It was electrifying, certainly, but it was totally unsuitable for the then-running Western series Jonah Hex. 'Ed, it's gorgeous,' I said, 'but what the hell is it for?' 'I don't really know,' shrugged Ed. 'But I really like the name 'Hex' and I thought you might be able to use it for something.'" 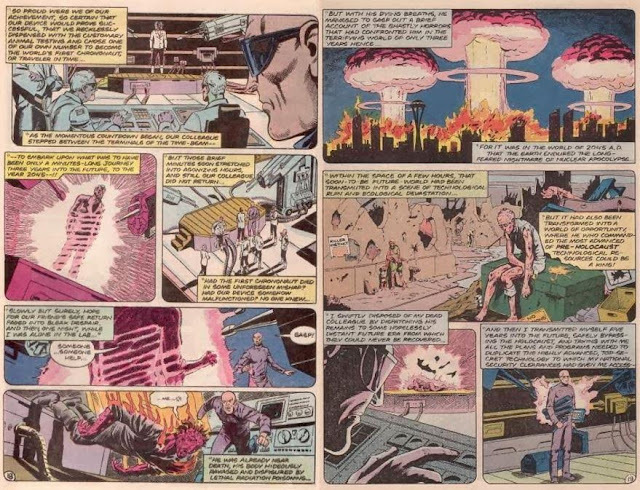 According to Fleisher, he had been dabbling with an idea for "a bleak, war-torn world" before Hannigan walked in what that logo (meaning Helfer’s influence could still be in there somewhere), but it wasn't until seeing that graffiti-style rendering of HEX that all the pieces came together in his head. Hannigan also provided some additional character designs for the new series, which Mark Texeira used as a starting-point for his own work once he was hired on as artist. 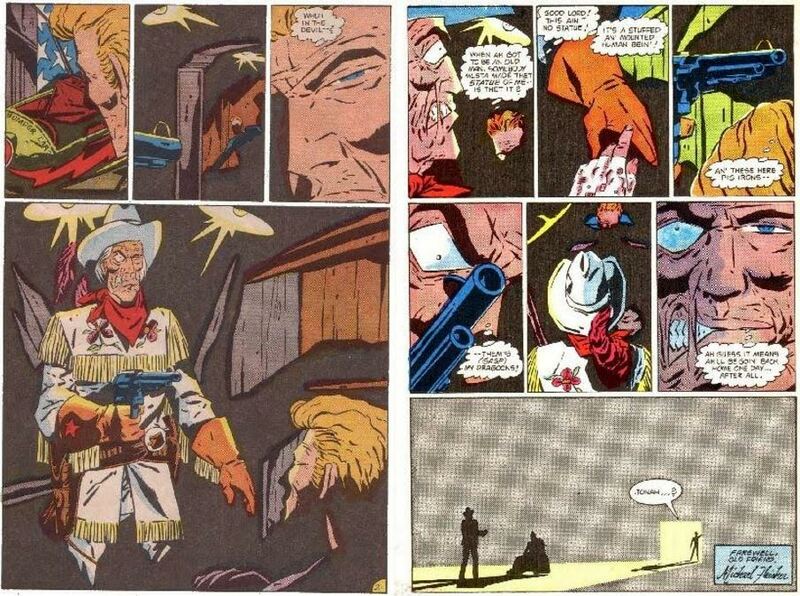 We can only estimate that this incident with the logo happened around the same time the axe came down for the Jonah Hex title, and therefore made it easier for all concerned to see this as a viable way to keep the character alive in the DCU, albeit in a future whose exact date had yet to be determined. In fact, a memo written by Greenberger dated May 30, 1985 (which you can find a copy of in 2008’s The DC Vault from Running Press) shows the company was still trying to nail down exactly when this new series was supposed to take place in the post-Crisis timeline just a few months before HEX #1 hit the stands -- many believed it should be set at least 500 years into the future, while Fleisher wanted it a mere 80-100 years ahead. As Greenberger himself said when I asked him about it in 2012, "The editorial edict that we have one [consistent] timeline...was paid more lip service than actual adherence," meaning that Fleisher's eventual decision to have HEX take place in the year 2050 won out over everyone else's concerns. Stiletta introduces Hex to Falcon, the leader of the Reapers, who apparently thinks of Stiletta as part of his harem -- she defiantly plants a kiss right on Hex’s lips as a thank-you for saving her life, which leaves Falcon fuming and Hex looking confused. All the talk going on about raiding a nearby community for water baffles him as well, but he throws in with them anyhow, even though, in his words, "It don’t smell right." Sure enough, as soon as the raid goes south and the gang scatters to the four winds, Hex hears Falcon spouting off about how he’s going to "ride back here and turn this community into a graveyard!" Now knowing for sure that the Road Reapers are the bad guys (but holding on to the notion that Stiletta isn’t like the rest of them...that must’ve been some kiss), Jonah turns on Falcon, leading to some good ol'-fashioned fisticuffs in the desert. Around the same time, the sky opens up and it begins to rain, but this isn’t a good thing: Stiletta had warned Hex earlier about the "acid storms" that pour down on the wasteland, and he immediately feels it eating through his fine Confederate-gray coat. Luckily, Stiletta also told him about the protective "zone suits" the Road Reapers wear, so after knocking out Falcon, he ditches his own clothes, strips the suit off of Falcon, and leaves the skunk to dissolve as Jonah roars off on his cycle. In twenty-five pages, we’ve watched Jonah’s past life get torn from him in bits and pieces -- his environment, his weapons, even his uniform -- until all that remains is the man himself, clad in strange clothes and riding a tricked-out chopper. In HEX #2, he runs across three American soldiers that were plucked outta 1968 Vietnam, but were accidentally beamed out to the wasteland instead of Borsten's complex. The captain of the group, a black man named Stanley Harris, takes an immediate dislike to Hex. "I don’t make a practice of shakin' hands with you Southern boys!" he snaps the moment he hears the gunfighter’s drawl. The other two soldiers, Berkowitz and Winslow, try to smooth things over, but they don’t have much time to chit-chat before Borsten's men show up. They manage to wipe out their would-be captors, then commandeer one of the vehicles and head out. As they travel, the soldiers do their best to convince Jonah of what they figured out easily, namely that they’ve all been transported to the future. Hex, of course, ain’t buyin’ it, even after being shown the book Berkowitz coincidentally had on him, which contained an eyewitness account of Jonah disappearing from the Red Dog Saloon in 1875. Despite his disbelief, Hex does offer up information about Borsten’s complex and what he saw there, and the soldiers figure it must hold the key to them all getting back to their proper timeframes. They’re gonna need more firepower before they attempt to break in, however, and Winslow directs them to the remains of a military research base -- seems he grew up in Seattle, and his father worked at that base in the time he came from -- but while the base’s personnel are long-gone, the robotic defenses they left behind nearly wipe Hex and his new pals out. Luckily, Stiletta shows up at the last second to save Jonah's bacon...a rather convenient turn of events that none of them never bother to question. That night, after they fix up one of the flying machines found at the base, Stiletta leads them to the Needle (the name for Borsten’s complex) and helps them break in. 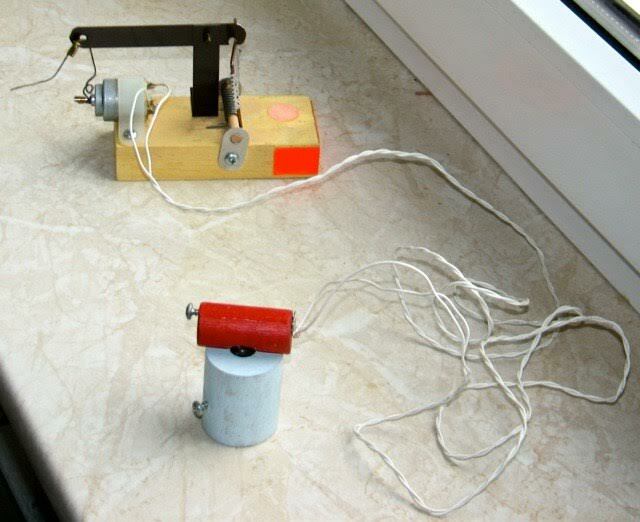 As they make their way down a corridor, a laser grid suddenly fires up, killing Berkowitz and Winslow instantly. Harris immediately accuses Stiletta of betraying them, then shoots her as Hex looks on in shock. “Yuh kill-crazy lunatic!” Jonah hollers, slugging him, but Harris quickly shows the gunfighter the truth: “Stiletta” was actually a robot, sent by Borsten to lure Hex back to the Needle. Harris had seen a flicker of light in her eyes, betraying her machine nature, but Jonah can’t comprehend this any better than the rest of the madness he’s seen. When Borsten’s guards show up, though, he can comprehend that just fine, so he and Harris blast away at them while the pair try to escape. Unfortunately, they get separated, and Jonah ends up escaping the Needle alone. HEX #3 reveals the reason why Jonah and all those other soldiers got pulled out of their proper times: Borsten is in the reenactment business, using real people from history to fight battles for his wealthy clients to bet on. 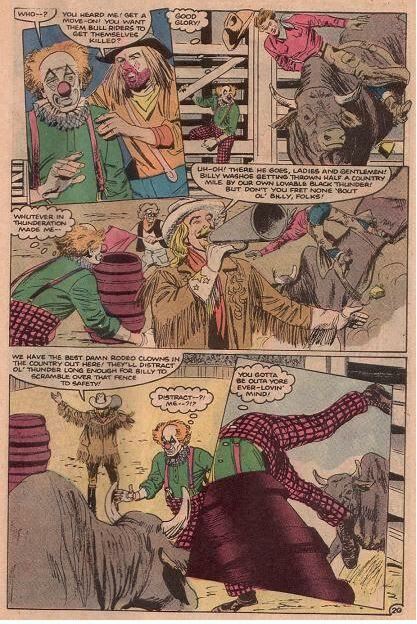 Jonah Hex was supposed to be his newest attraction, and Borsten had advertised this in advance, which is why he's so eager to get the gunfighter back. In HEX #4, we change up artists a bit: Ron Wagner penciled this tale, while inker Carlos Garzon (who also worked with Texeira on the previous issue) provides some continuity to the art style. A lot of backstory gets filled in this time around, starting not long after Jonah -- who’s just about to drink from a small spring he’s found in the desert -- meets Stiletta once again. He immediately pulls a gun on her, gasping, “You--you ain’t human! Yo’re some kinda machine!” Stiletta has no clue what he’s talking about, but reasons that he must’ve seen a robot that looked like her. Stealing designs for both the time machine and several other technologies, Borsten figured he’d bypass the nuclear holocaust and set himself up as king of the wasteland (the reenactments are just a hobby, I guess). He didn’t count on a criminal organization known as the Conglomerate gaining a foothold before him, thanks to them controlling the world’s supply of Soames, but he’s working on a way to bring them down using his time-travel tech. Not long after that info-dump, a flying machine tears outta the sky lookin’ to cut down Hex and Stiletta. In the previous issue, Jonah had killed a guy who was peddling mind-altering drugs, and we find out in HEX #5 (which has Texeira back on penciling duty) that he worked for the Conglomerate, who've sent their goons out to search for those responsible. Jonah and Stiletta kick the snot outta them and steal their ride so they can get back to civilization (or at least what passes for it these days). The Conglomerate doesn’t take kindly to this, especially after one of them -- who was looking forward to seeing the gunfight Borsten promised a couple of issues ago -- recognizes Hex in some surveillance footage, and figures Hex must be working for Borsten. In retaliation, they send out their own "hired gun": a bruiser named Chain with a buzzsaw hand and titanium body armor. After a five-page brawl, Jonah manages to flatten him in a car-crusher, but this doesn’t mean his troubles are over, as some of the Conglomerate’s other goons take him and Stiletta captive at the beginning of HEX #6. Surprisingly, they’re not interested in killing him, and instead the Conglomerate offers Hex a job: destroying Borsten's time machine before he can use his stolen tech to neutralize the radiation in the water table, which would makes Soames worthless and bankrupt the Conglomerate. A few of their men have already infiltrated the Needle’s personnel, but Hex is “a regular one-man army”, so they want the gunfighter to “surrender” to Borsten’s forces in order to gain access to the time machine, and guarantee Hex that they’ll send him back to 1875 before they destroy it. Stiletta wants to help out with taking down her father -- when Borsten escaped to the future, he didn’t bother to warn his family, and Stiletta survived the nukes by sheer luck -- but Jonah refuses, then rides off alone to a spot where Borsten’s men can capture him (though he first puts up a bit of a fight to make it look good). In HEX #7, the Conglomerate’s inside man shows up to release Jonah from his stasis tube and assist in the plan. Unfortunately, a guard kills the man right afterward, and accidentally triggers the explosives they were going to use to blow up the time machine. This sets off a chain reaction throughout the Needle, and Jonah has to try and get to the time machine alone before the whole place blows sky-high. Little does he know that backup is on the way: Stiletta has ignored Jonah’s wishes and snuck into the Needle, and she soon runs into Harris, who’s been tortured for the last few issues by Borsten and just managed to escape. After an off-screen confab, they realize they’re on the same side and head off to find Hex. They finally meet up with him in the chronal chamber in time to save him from being shot by Borsten. 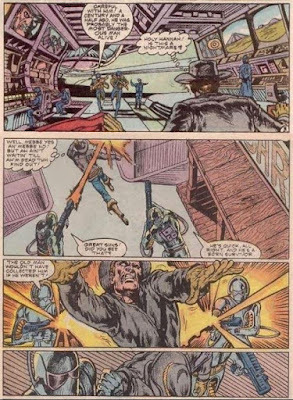 As Hex and Harris prepare to depart, more guards bust in, rescuing their boss and shooting Stiletta -- while Harris vanishes, Jonah jumps off the platform without a second thought to save her, and the time machine is destroyed as more explosions tear the chamber apart. Hex and Stiletta escape the Needle by the skin of their teeth, while Reinhold Borsten is shown being engulfed in flames. Despite having no impact upon the story itself, the Legion's presence does signal a turn in the title’s overall content, which will become clear with the next issue. In our final installment, we have a "Requiem for a Gunfighter" as Fleisher and Hex part ways. Over the past several entries, we dove in on SM’s discussion piece wherein he opines on the no-longer-rumor of John Byrne coming in to revitalize the Man of Steel for the complex 1980’s DC Comics fan. Today we will check in with some more of the conversation his post encouraged. 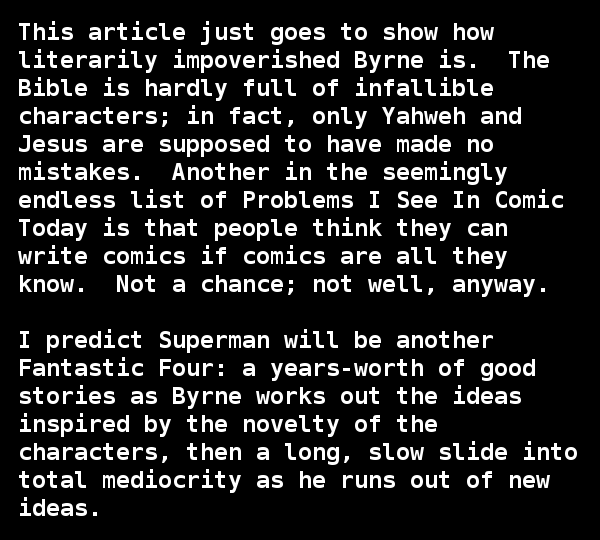 Byrne’s Fantastic Four having only "a years-worth of good stories" is a perfectly reasonable opinion to have. It has been many years since I made my way through it, though upon reflection, I would have to disagree with TM’s assessment. I may be more of a Byrne-booster (or victim, depending on one's mileage and vernacular), but I felt as though throughout much of the Fantastic Four run, he was able to keep things rather fresh. He renamed the Invisible Girl the Invisible Woman and made her a force to be reckoned with, he had a fantastic (pun intended) Galactus tale which led into the thought-provoking and controversial Trial of Galactus storyline. He shook up the team roster following Secret Wars with She-Hulk replacing the Thing. 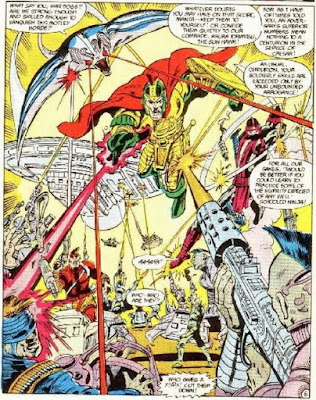 I’m not saying TM is necessarily wrong, as quality is surely subjective... however, to say Byrne only had a years-worth of stories in him, is a bit difficult for me to swallow. Well, did continuity die with Crisis? I suppose there is an argument to be made for that. I feel, however, the Crisis was a way in which to make DC continuity a bit more linear than it had been. Whenever I read I pre-Crisis story, be it in single-issue or collected edition format... I’m never quite sure what "matters" or even what "mattered" at the time. 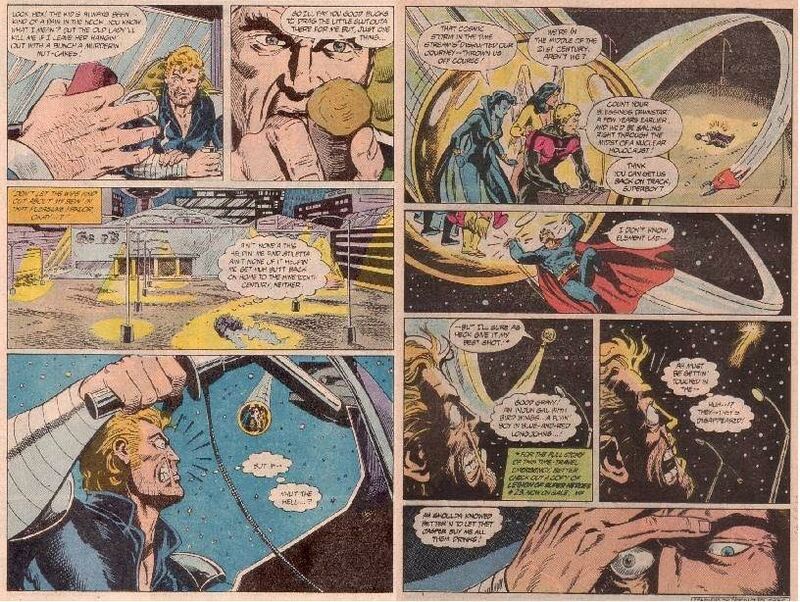 You can think back to creators like Bob Haney (who actually had a World named after him in the DC Multiverse to explain away how many of his stories took place... because he did not care about continuity). One issue, Batman would have a secret brother... who would never be heard from again. Somehow, on Earth-1 Justice Society members were having team-ups with Justice Leaguers as though they always occupied the same Earth. With Crisis, everything was brought into one Earth. Everything suddenly tied together... and (at least to me) mattered. It very much felt like (and this was cause for many a complaint) the early Marvel Universe. Apropos of nothing, whodathunk emoticons existed in the mid-1980’s? 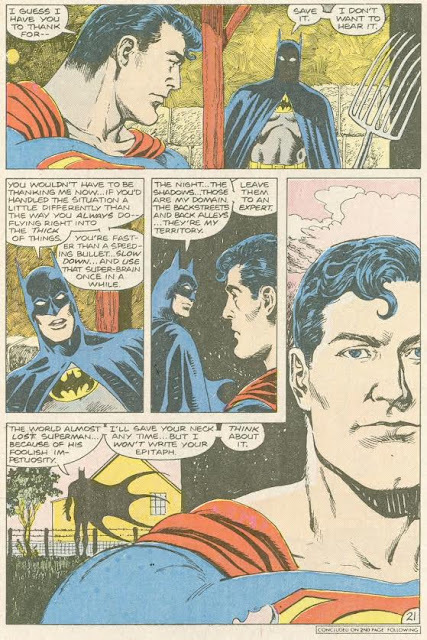 To discuss his closing shot, World’s Finest Comics finished its FORTY-FIFTH year (books barely last 45 weeks these days) run with issue #323 (January, 1986) with Superman and Batman going their separate ways. Get this... Batman was upset at Superman, for his recklessness and impetuosity. This is the pre-Crisis, not yet powered-down Superman, here... a guy who can more than take care of himself. I’m pretty sure Bats was also upset that Superman was infringing on his turf of back alleys. I think I gotta agree with JSDY on this one. This really was an odd way to dissolve their almost half-century (our time) partnership. With Crisis on Infinite Earths winding down and a brave new DC Universe in the offing, it was decided that Superman and Batman while coexisting wouldn’t be the bosom buddies they were before. Many of their meet-ups post-Crisis would feel fairly contentious. It would be almost two full decades before the next Superman/Batman team-up book... which was called, well... Superman/Batman and would run from 2003 until the dawning of the New-52 in mid-2011. That’ll do it for this time. Next time we will conclude our coverage on the discussion prompted by SM’s post, including some more minor criticisms on Byrne and another Power Girl theory. As I mentioned in our last few pieces... I know some corners of the interwebs have amazingly knowledgeable and passionate Superman fans, so if you have any additions or corrections, please feel free to contact me in care of this website. Thank you for reading. It's not TOO late - there's still a week left to enter our submission contest! What urgent news has captured the Super Friends' attention? Complete this image, scan it and send it in, and you could win a 'mystery prize'. Complete this image. You can use any media you want (ex: pencils, pens, markers, coloring pencils, paint, ink), but it's got to be your own work - so no cutting & pasting other digital images. You can also alter this image any way you want (ex: shrink it, enlarge it, draw over the characters). The 'best' submissions will be eligible for a 'mystery prize'. What is the 'best'? We're not sure - we'll know it when we see it. The 'best' could be the funniest, the cleverest, the best drawn, etc. As we said, we're not sure yet. More than one 'mystery prize' may be given out. No more than 1 (one) submission per person. 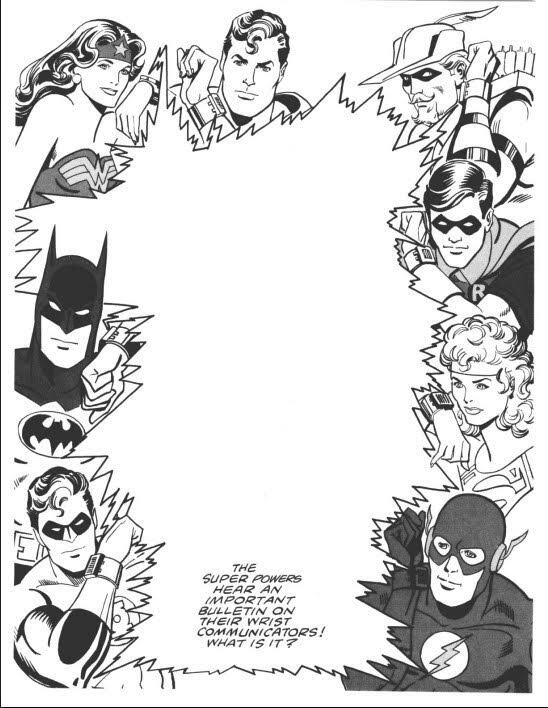 Along with your submission, include your favorite DC comic book characters from the 1980s and your personal mailing address (don't worry - we won't send you junk mail). Let us know if we can can credit your real name for your submission (or if there's another name you want to use). Make sure you 'like' our Facebook page and/or our Twitter. Be funny, be serious, be somewhere in between - but don't be prejudiced. "I hereby authorize DC in the 80s (www.dcinthe80s.com) and its assigns and transferees to use and publish my submitted image electronically." This contest is only open to residents with a North American mailing address (because we're not made of money). Yes, this includes Alaska, Hawaii and Quebec. Submission deadline is April 30th, 2016.